89 (16 Dec 1943), 92, 93, 95 (Aborted), 96, 97, 98, 100, 101, 102, 103, 105, 107, 112, 113, 114, 115, 116, 117, 118, 121, 122, 123, 124, 131, 132, 124, 135, 136 (18 April 1944). Non Credited Aborted mission 95 - #4 engine failure. Turned back near Frisian Islands. 1Lt Lloyd L. Holdcroft (P)(POW)- 29 dispatched (28 credited) missions flown: All as First Pilot. POW on 18 April 1944 (Mission 136). 1Lt Clyde W. Bradley, Jr. (CP)(POW) - 29 dispatched (28 credited) missions flown: 27 credited missions with 1Lt Holdcroft (All Holdcroft missions except mission 100 where substitute CoPilot Lt John M. Chapman was used); With Lt Earl M. Thomas (Mission 109). POW on 18 April 1944 (Mission 136). 2Lt Charles M. Pace (N)(POW), T/Sgt John A. DeMarco (E)(POW), S/Sgt Walter G. Francis, Jr. (R)(POW), S/Sgt Lloyd F. Kern (BTG)(POW), S/Sgt Walter C. Slusser (LWG)(POW), S/Sgt Walter L. Hustus (RWG)(POW), S/Sgt Robert A. Krumholz (TG)(POW) 29 dispatched (18 credited) missions flown - All 1Lt Holdcroft missions. With other Pilots - no missions. All became POWs on 18 April 1944 (Mission 136). 1Lt John B. O'Donnell (B)(POW) - 27 dispatched (26 credited) missions flown: 25 credited missions with 1Lt Holdcroft - All Holcroft missions except first three (89, 92, 93); With 1Lt George E. Underwood (Mission 109). Became a POW on 18 April `1944 (Mission 136). 18 April 1944, Mission 136, to Oranienburg Germany in B-17F 42-97552 The Road Back (360BS) PU-O. B-17 was last seen just before making a turn after the target. Two engines were hit by flak and allowed to windmill. It continued on a straight course after the target and left the formation. The crew flew for one and one-half hours before crash landing after throwing out all non-essential items. At one point a German ME-109 flew alongside, recognized that the B-17 could offer little resistance, saluted, and flew away. The B-17 crashed near Soltau, Germany, 65 km north of Hanover (Between Hamburg and Hanover) in a narrow field on a wheels up "Belly" landing. The B-17 was set on fire to prevent the enemy from using the parts. The entire crew survived the crash and divided into three groups to attempt to avoid capture. All became POWs after their unsuccessful evasion attempts. 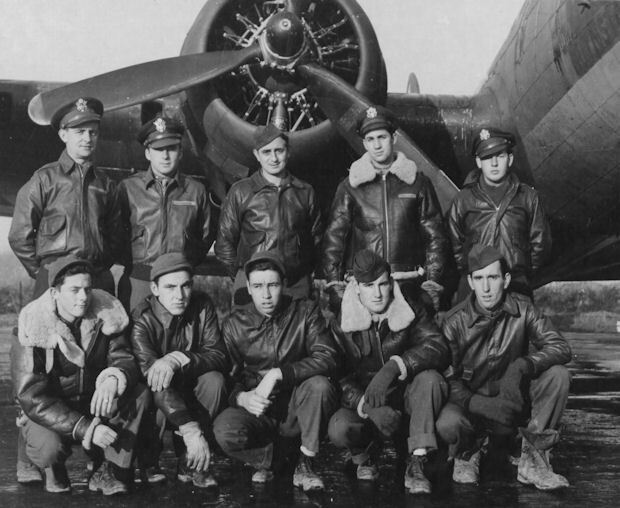 The original crewmen were on the last mission of their 25 mission combat tour (Missing Aircrew Report 4009).